I’ve been seeing posts on Facebook lately about the new season of The Gilmore Girls on netflix and was curious to see what all the fuss was about. To my delight, the first season was there too so I could start from the beginning. I LOVE IT! I can’t wait to binge all holiday season. Thanks netflix! 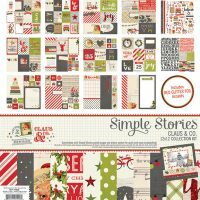 The left side of the page has a few cards from the Claus & Co collection by Simple Stories. I’m big on lace doilies and sequins, so you’ll see a lot of that throughout my album. The number 2 was from my stash. 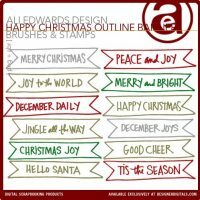 The currently watching card is from Lilypad and the Good Cheer outline is from Ali’s Happy Christmas Outline Banner collection. Both the doily and black washi tape with green christmas trees is from Michaels. For the second page I googled season 1 and found the DVD cover pic. I adhered it to some lacy paper I picked up at Michaels. I thought it went well with the lace doily on the first page to tie the two together as well as a few well placed sequins! How’s your album coming along? Thanks for stopping by! p.s. You can see all my other December Daily posts here.